From the volcanic slopes of Indonesia to the cloud forests of South America, there is a world of exciting coffee out there waiting to be discovered and enjoyed. We’re renowned for finding the best the world has to offer and then putting the name ‘Ciao’ on the bag. So how do we do it? Simple, we go looking for it, literally! Our coffee roasting partners regularly travel the world, personally visiting the coffee farms and cooperatives where the green coffee beans are sourced from. Close attention is paid to the social, environmental and economic impact that coffee growing has on the local communities, ensuring wherever possible, the coffee producers receive a fair price, working conditions are acceptable and the business is sustainable. Providing award-winning espresso blends from the finest and most ethically-sourced beans from around the globe, Ciao Coffee enables you to discover and enjoy a whole new world of exciting coffee. We work with experienced coffee roasting partners, who travel the world to visit cooperatives and coffee farms who not only offer the best quality beans, but who do so in an ethical way. We only use beans from coffee farms where producers are paid a fair price, working conditions are acceptable and the business is sustainable. It is our mission to ensure that your cup of Ciao Coffee has been produced with its social, environmental and economic impact in mind. Once the best quality beans have been chosen, it is over to our Master Roasters, who work their magic to turn these simple green beans into the very best espresso blends for the UK market. Top quality Arabica and Robusta beans are sourced from a range of places from the volcanic slopes of Indonesia to the cloud forests of South America, before undergoing daily cupping, sample roasting and profiling to create our award-winning blends. From whole roasted beans to filter and ground coffee, we offer a wide selection of fine coffees to suit all tastes. For businesses, the Ciao Coffee brand offers more than just coffee: it's a chance to offer an authentic Italian coffee brand to your customers. 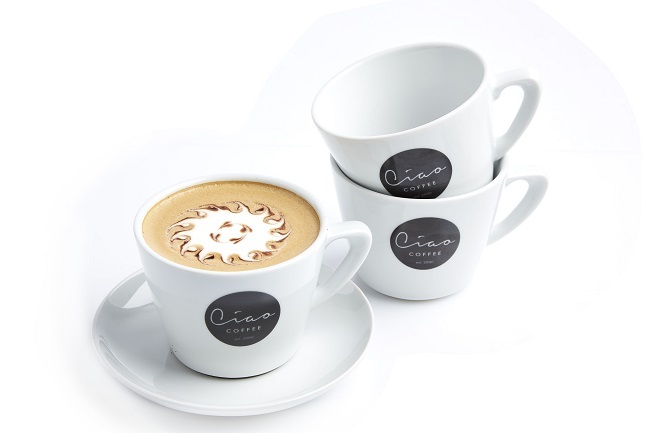 Not only do we offer our range of great coffees, but also Ciao-branded crockery, sugar sticks and point of sale information such as posters, table menus and information cards to cement your brand's reputation as a provide of great coffee. Our thousands of customers - including coffee shops, hotels, restaurants and cafes as well as schools, offices and home drinkers - enjoy a selection of coffees that not only taste fantastic and have a fully traceable heritage, but that are affordable too. Our blends start from as little as 5p per cup, and range up to 9p per cup for our premium Fairtrade Organic Espresso blend: a favourite amongst our customers. However you choose to serve your coffee, our Ciao Coffee range can help. From whole beans, filter coffee or ground blends, our great choice of coffees is available in a range of blends from darker to lighter roasts, every one having a different personality. The Ciao Coffee range is also available in a variety of pack sizes, meaning that we can provide the perfect coffee for everyone from the smallest coffee shop to the largest hotel, with our knowledgeable customer service team on hand to help you to make your decision. And with our great range of commercial coffee machines, coffee equipment and accessories also available, we can provide you with everything that you need to produce the perfect cup. Medium body with milk chocolate, hazelnut and a long smooth finish with a deep rich crema. Choice Arabica beans, a little acidity, plenty of punch and a lingering aftertaste centered around a strong body and lots of flavour. Well balanced, Arabica from Central America and Robusta from Kenya. Mildly sweet, chocolaty overtones, amazing aroma and lasting crema. Plenty of body and a smooth rounded aftertaste. A lightly fruity acidity and sweet notes. A well balanced coffee. Brazil as the world’s top producer of Arabica beans, with over one third of world production. Colombian coffee beans are sweet & rich in flavour, heavy bodied, have a bright acidity, and are intensely aromatic. Guatemala coffee is very sweet, of average acidity and with an intense aroma ranging from chocolatey to flowery. Central American countries such as El Salvador, Costa Rica & Mexico are “sweet & light” with more acidic notes. Sumatran coffee beans exhibit complex characteristics & are recognised as some of the heaviest and smoothest. Indian coffee has a full body, a note of positive bitterness and a spicy aroma. African countries produce excellent quality coffees. Kenya, with its mild, steady climate, produces acid, aromatic coffee, whereas Ethiopia produces the best washed Arabica: flowery with notes of caramel. Denby Dale Coffee is dedicated to providing the perfect cup of coffee for all our customers. We specialise in the supply of commercial coffee machines and domestic coffee makers, including espresso machines and a range of famous branded coffee machines such as Rancilio, Gaggia, Franke and Jura Impressa. We also supply premium coffee beans and all related coffee accessories. We are true coffee experts with an established reputation for quality and service. The word ciao (Italian pronunciation: [ˈtʃa.o], English: /ˈtʃaʊ/) is an informal Italian verbal salutation or greeting, meaning either "hi" or "goodbye". Originally from the Venetian language, it was adopted into the Italian language and eventually entered the vocabulary of English and of many other languages around the world. The word is mostly used as "goodbye" or "bye" in English, but in modern Italian and in other languages it may mean "hello" or "goodbye".